Also serving communities of South Glens Falls, Warrensburg, Argyle, Granville. There are 5 Assisted Living Facilities in the Queensbury area, with 4 in Queensbury and 1 nearby. The average cost of assisted living in Queensbury is $4,010 per month. This is higher than the national median of $3,346. To help you with your search, browse the 17 reviews below for assisted living facilities in Queensbury. On average, consumers rate assisted living in Queensbury 4.3 out of 5 stars. Better rated regions include Saratoga Springs with an average rating of 4.3 out of 5 stars. Caring.com has helped thousands of families find high-quality senior care. To speak with one of our Family Advisors about assisted living options and costs in Queensbury, call (855) 863-8283. Located between Lake George and Saratoga Springs, Queensbury is a charming]town of about 20,000 residensts, 20 percent seniors, and considerably more affordable than the average community in New York state. For seniors and their families who are seeking an assisted living solution in the Queensbury area, there are at least five different communities from which to choose. In New York, these assisted living residences are licensed and regulated by the New York State Department of Health. Seniors who decide to live in an assisted living community in the Queensbury area should prepare themselves for harsh winters. The city's average low temperature in the winter is a chilly 10 degrees Fahrenheit. Living costs in Queensbury are above the national average but less expensive than the New York state average. Where the average New York city has a cost of living that is 29 percent higher than the U.S. average, Queensbury's living costs are only 10 percent higher than the U.S. average. Queensbury's public transit system provides affordable fixed route and paratransit bus services around the city and to outlying areas. Seniors may qualify to receive discounted fares. The Queensbury area is home to world-class medical facilities, including Glens Falls Hospital, in the event of medical emergencies or illness. Queensbury has an array of community resources for seniors, including the Office for the Aging, an organization that offers free information for seniors about long-term care as well as the Queensbury Senior Citizens center. Assisted living facilities in the Queensbury area may offer their residents outings to the area's many attractions, including the Charles R. Wood Theater, Adirondack Ballet Theater and the Hyde Collection. Assisted Living costs in Queensbury start around $4,010 per month on average, while the nationwide average cost of assisted living is $4,000 per month, according to the latest figures from Genworth’s Cost of Care Survey. It’s important to note that assisted living rates in Queensbury and the surrounding suburbs can vary widely based on factors such as location, the level of care needed, apartment size and the types of amenities offered at each community. Eligible seniors in Queensbury and throughout the state of New York can request financial assistance to pay for assisted living through the Supplemental Security Income (SSI) program, which offers supplementary income to qualifying seniors. 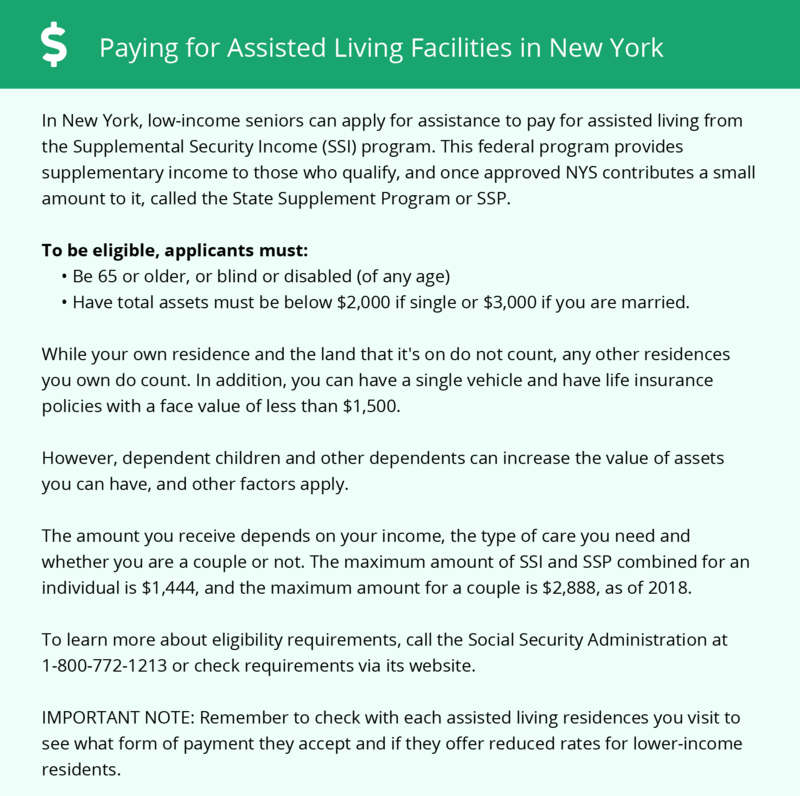 Individuals who are approved for SSI may then receive additional help via New York's State Supplement Program (SSP). Queensbury and the surrounding area are home to numerous government agencies and non-profit organizations offering help for seniors searching for or currently residing in an assisted living community. These organizations can also provide assistance in a number of other eldercare services such as geriatric care management, elder law advice, estate planning, finding home care and health and wellness programs. To see a list of free assisted living resources in Queensbury, please visit our Assisted Living in New York page. Queensbury-area assisted living communities must adhere to the comprehensive set of state laws and regulations that all assisted living communities in New York are required to follow. Visit our Assisted Living in New York page for more information about these laws.